Setup and ready for action w/ @satostudios . LED Ring Light mounted to #DJI #RoninM, #KayoMaxtar v-mount battery in backpack, #Sony #A7sII @rokinon 14mm. As a special request, I used my 9.Solutions clamps, rods, and gags to build a frame for holding the 18" LED Ring Light over @satostudio's DJI Ronin-M Gimbal. Combined with a wide angle Rokinon 14mm lens on a Sony A7sII, this adds that cliche' music video look. Will post samples when we have the final music video done. Posted in Instagram FEED. 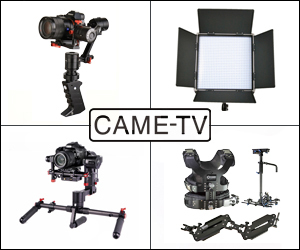 Tags: 9.solutions, 9solutions, DIY led ring light, DJI Ronin, gimbal, LED ring light, ronin-m, roninm, satostudio on April 28, 2016 by Cheesycam. Mounted this LED Ring Light with the DJI Ronin (full size) Gimbal to shoot through with a Sony FS7 for a Music Video Project. Posted in dslr video, Instagram FEED. Tags: DJI Ronin, LED ring light, satostudio, sony fs7 on February 24, 2016 by Emm. 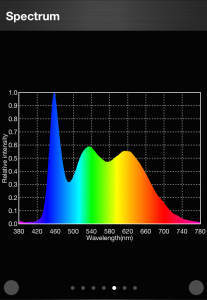 I recently got my hands on a couple of new Bi-Color FotoDiox FlapJack LED Edgelights. The FlapJack lights have been around for a little while but the product line has now expanded with several new sizes, and now in a temperature adjustable version. While they are not meant to replace high power LED lighting, the unique design allows these lights to be placed close to subjects while offering a very flattering, soft, wide spread, diffused light. No filters, gels, or modifiers required. Because of this, I see them as being perfect for on-camera use. The large evenly diffused panel is much more comfortable for subjects to look towards, and will reduce harsh shadows. My favorite version of the FlapJack LED Edgelights is the 4x11 design which when mounted horizontally offers a slim and low profile light, but with a very wide spread. Rotate it vertically, or maybe add a handle for off camera use, and you have a very nice strip light. 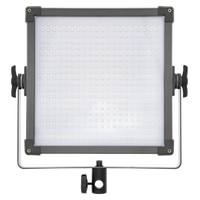 If you're duties require an on-camera light for such things as event coverage, documentary, product, or macro, the FotoDiox FlapJack LED Edgelights is certainly one to consider with it's unique properties. Here's another video from FotoDiox along with a description of the video discussing their new lights and a Giveaway opportunity. Today we're launching 5 new bi-color models of the FlapJack LED Edgelight, fully adjustable between 5500K and 3200K color temperatures. 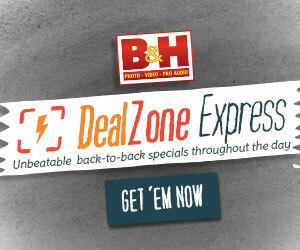 Now you can recapture the warmth of the classic tungsten bulb with the power and portability of a FlapJack. Want even more power? 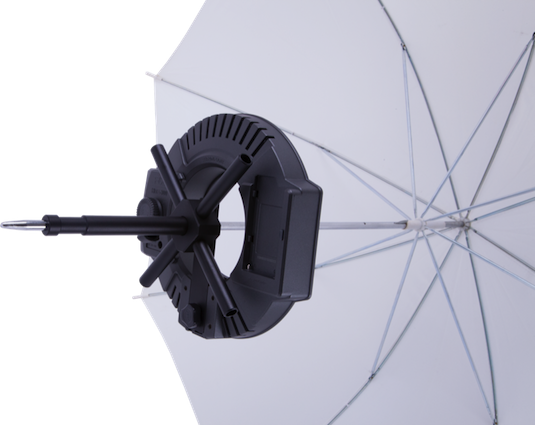 The new models include the brand new 18” FlapJack Studio: an ideal solution for shooters seeking a powerful softlight for larger spaces. 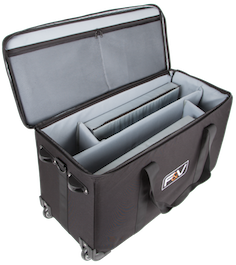 Between now and August 10, you're invited to enter a random drawing for a FREE C-300RS 10” circular bi-color FlapJack by sending an email to FlapJack@fotodiox.com with “FlapJack me!” in the subject line. 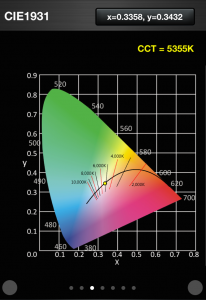 For more information about the various sizes and options available for the FlapJack Daylight or Bi-Color LED Edgelights, visit http://FotoDioxPro.com (here). Posted in dslr video. 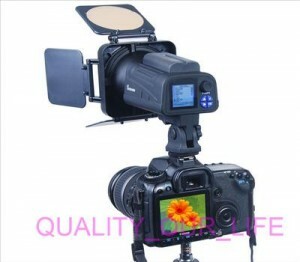 Tags: beauty light, flap jack led edgelight, flapjack led lights, FotoDiox, fotodioxpro, led light gimbal, LED ring light, led softbox on August 6, 2015 by Emm. 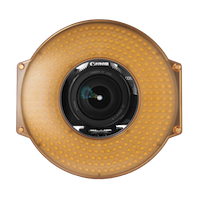 For those familiar with the 18" CFL Ring Light (especially those of you who have used it in production), you'll get a kick out this recent product. 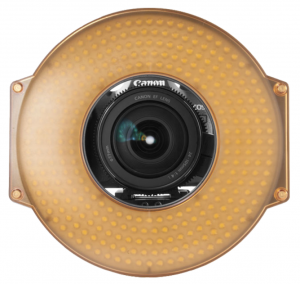 This new ePhoto R-640 LED Light takes the familiar form factor of the 18" CFL but replaces it with 640 High CRI LED Bulbs. While I'm a big fan of the 18" CFL (compact fluorescent) version, it always needed to be plugged in to an AC wall outlet (no DC battery option). Also the fragile CFL bulb made it queestionable to travel with and use on location. 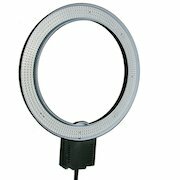 This new R-640 LED Ring Light solves those issues by offering up long lasting durable LED bulbs and a 14V-15V DC input for optional battery power. The R-640 claims to use high quality LED bulbs, and our tests with the AlliedScientific Lighting Passport LED Light Meter showed excellent results. 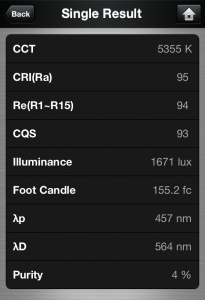 Tested at a distance of 3 Feet the R640 delivered a CRI rating of 95 / over 1670 LUX [155 FC] / and a color temp of 5400K. 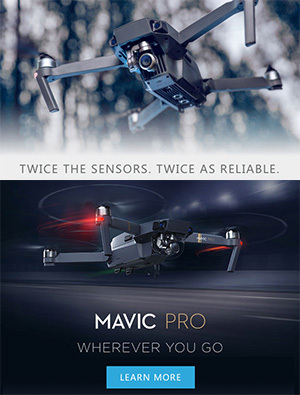 Not just a unique form factor that will allow for creative use, but also a great light at a great price, and for more information visit the product page (click here). Posted in dslr video. Tags: Beauty Dish, beauty ring light, Cheesycam, CN-640, ephoto ring light, GearAddix, Keiko Alingas, LED ring light, LED Video light, R-640, r640 led video light, roland posadas on August 8, 2014 by Emm. 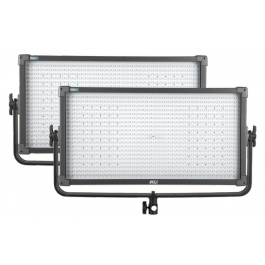 The portable and small R-300 LED ring lights from F&V carry about about the same power as a large 1x1 LED panel in a much more travel friendly form factor. Though it can be used on camera as a ring light, it's just as effective when used in a 3 piece lighting kit set on stands. 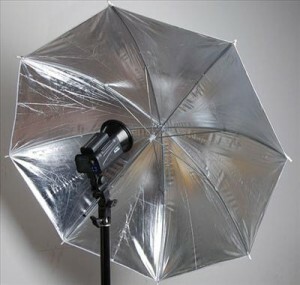 If you need a softer more diffused light from the R-300, there is a new Portable Softbox kit available. 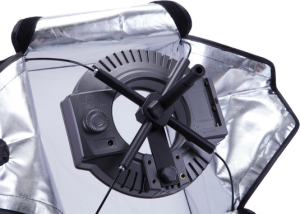 The R-300 Soft Box will allow you to modify your light, creating a larger, soft, single source light. 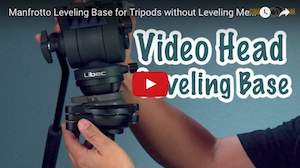 This becomes the perfect solution for interviews, portraits, and product photography. Your imagination is the limit to this tool's application. 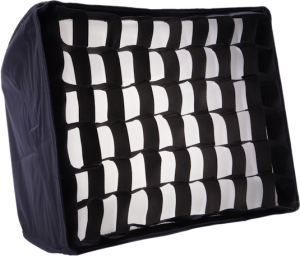 The soft box also comes packaged with a velcro honey comb which allows you to focus the light's beam and reduce spill. 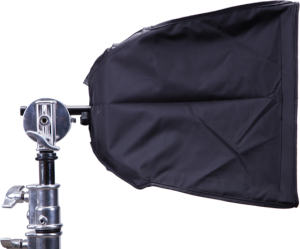 The R-300 Soft Box is made from a thick, high-quality nylon. 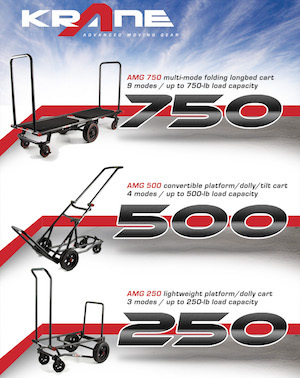 Four large flaps in the back make it easy to install the soft box rods and R-300 w/ Bracket. 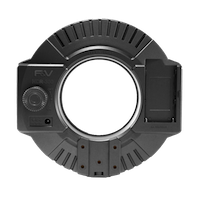 A designated notch in one of the flaps makes accessing your R-300's dimmer knob easy. 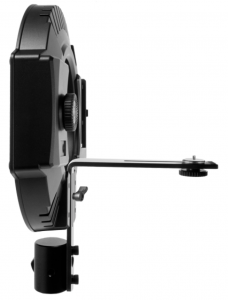 The R-300 mounts to a matte-black, aluminum bracket system which functions as the soft box's speed ring. 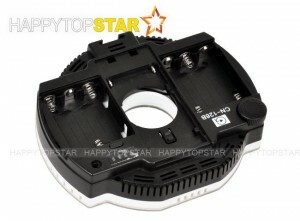 On this bracket are four receptacles that hold the soft box rods. The bracket has a 5/8'' stud that allows you to mount the soft box system using a c-stand or universal holder. The center of this 5/8'' stud is hollow which allows you to mount a translucent or reflective umbrella to the unit. 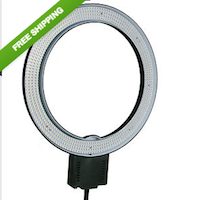 For more information about the Softbox and Bracket kit for the R-300 LED Ring light visit the F&V website (click here). Posted in dslr video, LED video lights, Lighting. Tags: F&V, fvlighitng, LED ring light, Light Stand, r-300 r300 led light softbox, softbox kit, umbrella bracket on July 1, 2014 by Emm. 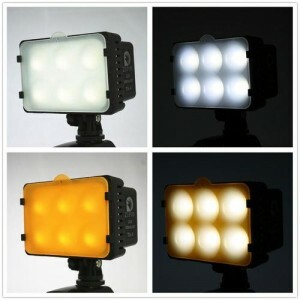 Finally, the F&V R-300 (LED Ring Light), K4000, and K4000S 1x1 LED Light Panels are ready to ship! 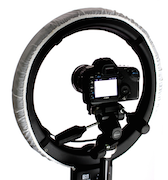 I personally have placed a pre-order for (3) of the R-300 LED Ring lights mainly for portability and the simple option of using inexpensive Sony batteries, and plan to use them mainly off-camera on light stands. I've been eagerly anticipating these lights since my pre-order, so excited to hear it's finally shipped. 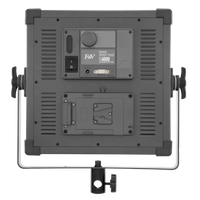 The K-4000 and K400S 1X1 LED Video Lights are also available on the site. 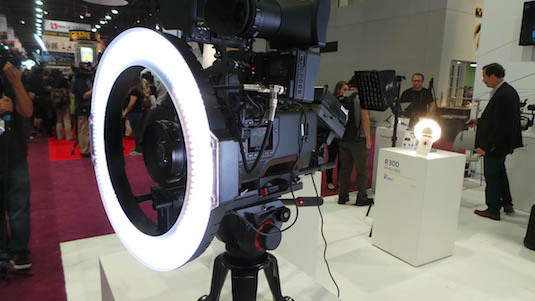 I've seen these lights at the last PhotoPlus NY show and was very impressed by the build quality and light output. You can purchase the lights individually, or check out the current specials for (3) 1x1 LED Lights in a kit starting at just $1050 ($350/each). That's very competitive pricing even against more popular LED lights on the market. 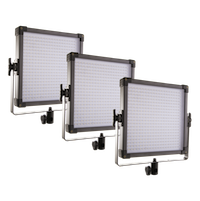 You can find the K-4000/K4000S light panels at the product page (Click Here). Posted in dslr video, LED video lights, Lighting. 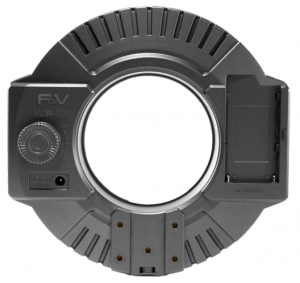 Tags: F&V Ring Ling, K4000 LED light panel, LED ring light, R-300 R300 LED light on November 27, 2012 by Emm. 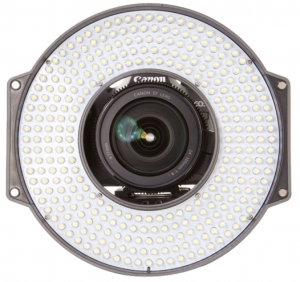 If you're shooting with DSLR Video, you've probably heard about the Z96 LED video light. 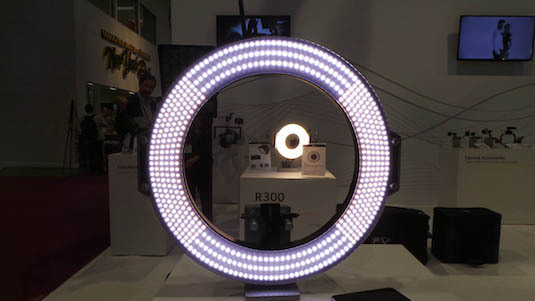 F&V is the company behind the popular light and one exciting product that will be available is the new R-300 LED Video Ring Light. We got a chance to see these up close at the PhotoPlus Expo, and these are excellent quality lights coming in at an excellent price. Product description states that the R-300 LED Light features 300 daylight-balanced LEDs which produce 1950 Lux @ 1-meter. An onboard dimmer offers seamless power variation from 0-100%. It has two power options: a Sony NP-F Battery Plate and a DCɸ2.5 jack. As stated in the video the light is brighter than Litepanel's $1800 dollar 1x1. Starting at $199 dollars, this will be a great light to be used both ON or Off camera and all powered by inexpensive Sony Batteries (instead of V-Mount). 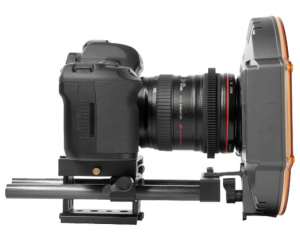 The new R-300 will be available to mount using a basic L-Bracket, or to a set of 15mm Rails. 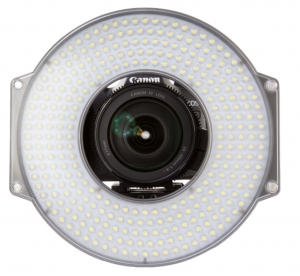 You can find more information about the new R-300 LED Video Light following the link to the product page (Click Here). Posted in LED video lights. Tags: F&V, fvlighting, Keiko, LED ring light, R300 LED Ring Light, z96 on November 14, 2012 by Emm. Here's a couple of unusual lights for video. 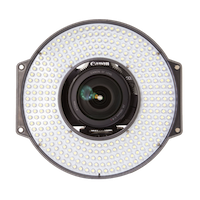 The first is this new CN-126B Flat LED Ring Light . 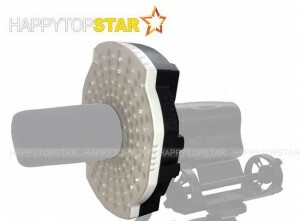 The design allows you to mount over your shotgun microphone, or on the camera hotshoe with the included mount. 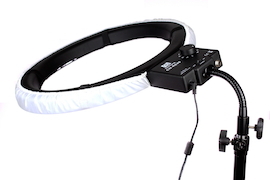 Mounting the LED light over a shotgun microphone is pretty much a copy of the RotoLight (as seen here). The Rotolight resembles those uber cheap UFO LED Camping Lights (as seen here). 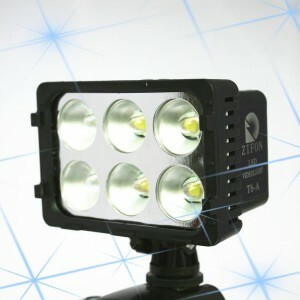 The next light is the Super Power T6A Video Light that uses 6 high powered LED Bulbs. Runs on Sony batteries, plastic diffuser, tungsten filter, dimmable, with battery status indicator. Quite a few of these were sold in the last month, but I can't seem to find any reviews just yet. This final most unusual light is this 250W Wireless Strobe (a.k.a flash) + LED Video light . Available in four different colors, comes in single or (2) piece kit that can be used as a continuous LED video light, or as a 250w flash for still photos, and tungsten or other creative color filters can be placed on the barn doors. Curious if the LED lights work simultaneously with the Strobe to work as modeling lights (for positioning your flashes). Place with an umbrella and you can fire the flash wirelessly with the included remotes. 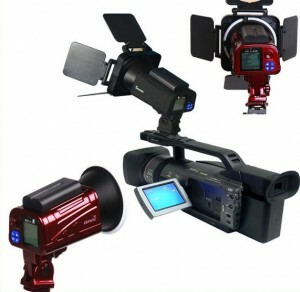 Comes with two flash head units, two wireless triggers, two Sony type batteries (AA battery adapter), and carrying case. Posted in LED video lights, Lighting. 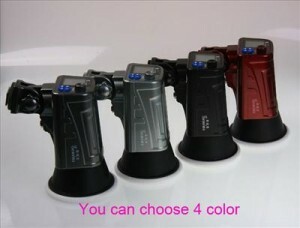 Tags: 126B, Flash LED Strobe, LED ring light, LED Video light, Super T6A LED Light on September 5, 2012 by Emm.